One Fat Frog Restaurant Equipment of Orlando has several makes and models of used ice machines for sale at the One Fat Frog Restaurant Equipment Super Mega Warehouse. If you’re unsure what pound ice machines you will need for your establishment, ask someone on the One Fat Frog Restaurant Equipment and they will be able to help you pick out the proper used ice machines for your eatery. The size of the used ice machine needed is in correlation with how many customers you will be serving a day. One Fat Frog Restaurant Equipment has these a 376lb., 1200lb, 1250lb, and a 1350lb. model available. All of the used ice machines available at One Fat Frog Restaurant Equipment come with 30 day parts and labor warranties. Each used ice machine is cleaned, refurbished, and tested by One Fat Frog Restaurant Equipment’s in-house staff of knowledgeable, humorous, and attractive technicians. Nothing leaves the One Fat Frog Restaurant Equipment warehouse until it’s working like new! NOTHING! If you’re in the market for a used ice machine, come into the One Fat Frog Restaurant Equipment Super Mega Warehouse in Orlando and check out the selection of used ice machines. 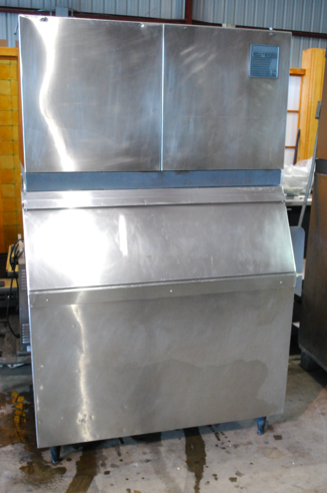 One Fat Frog Restaurant Equipment also offers quick cash and package deals on the entire stock of used commercial restaurant equipment – including used ice machines.